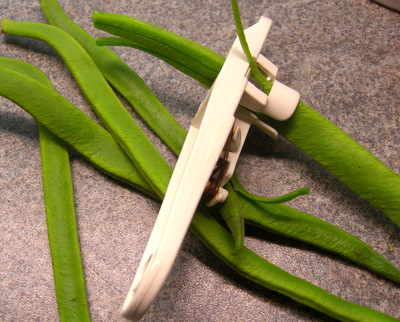 Runner bean season is upon us! Fresh, local grown beans of often unfeasible size seem to taste all the better for having been sliced thinly and the strings removed. Having tried many slicers, this one has pride of place in by cutlery draw – it’s made by Krisk (and I think, originally from Australia). It’s so easy to use, there’s a blade at the end where you top and tail the bean. You then press the bean through several blades where the bean is split into tidy slices. A great gadget! Treat yourself, you’ll wonder how you ever did without it.